I am always looking for products that are natural and good for you. I had heard awhile ago that Apple Cider Vinegar is really good for you. Apple cider vinegar is rumored to be a magical elixir to help with weight loss and digestion. Its medicinal uses date back to the time of Hippocrates, the father of medicine, who noted it as a remedy for many ailments with zero known harmful side effects. I knew someone who would drink some every morning. He said it was an important part of his diet and that it helped him feel better. 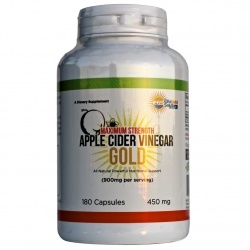 Elite Gold Apple Cider capsules are natural and free of harmful additives and preservatives. They are made in the USA and GMP certified. They are easy to use you just take 1 or 2 capsules up to 3 times daily with your meals. I take them with a big glass of water. I had been having some cramping in my legs at night and I meant to check with my doctor if maybe I need more potassium ~ but I haven’t had any cramping the last two weeks so I think the Apple Cider Vinegar Gold supplements are helping my legs. I will continue with using the Elite Gold Apple Cider Gold capsules – who knows it could even help me lose weight!